Legendary playback singer, 'Melody Queen' P Susheela was honored here on the occasion of International Mother's Day by Raindropss, a youth-based social organization widely known among people for spreading social awareness through entertainment and media. 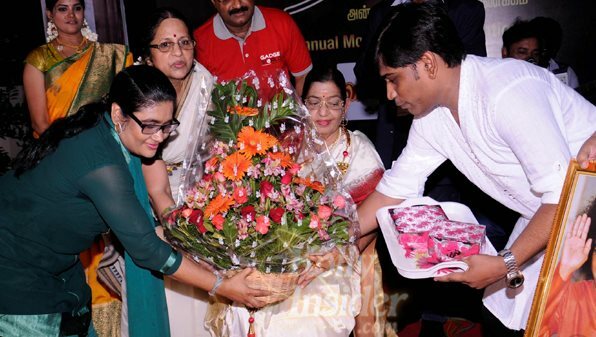 On the third edition of Raindropss, Mother's day celebrations, Raindropss felicitated legendary playback singer P Susheela for her outstanding contribution towards the music Industry, on the occasion of international Mother's Day. Music director A R Reihanah (Oscar winning music composer A R Rahman's sister), also the brand ambassador of Raindropss presided over the grand celebrations. This grand celebration was held at Anandham Illam, a free home for senior citizens in Ambattur. Raindropss celebrates Mother's day in Anandham Illam every year and this year was more special for the inmates, as the senior citizens in the home got an opportunity to meet and greet with their ever green melody queen P Susheela. Listening to the super hit numbers of P. Susheela made them to recollect their early day’s memories. Super Hits of P. Susheela and the Mother’s day special songs were performed by leading playback singers A R Raihanah, Shravan, Haritha, Aravind and Swetha supported by the Shamsudeen's Gentlemen Orchestra.